We all know Morgans Seafood is one of the most exquisite seafood restaurants is Brisbane, but did you know they also have the largest fresh seafood market in the state and amazing hot food take away? Seafood lovers will be in heaven with over 180 products spread over 30 meters of ice daily, fresh whole fish, local fillets, varieties of prawns, freshly shucked oysters, live crabs in tanks and an oyster bar for those shellfish addicts. You can even choose your favourite catch fresh from the trawlers and have it filleted while you wait! You can't get any fresher than that! You can indulge in the freshest seafood 7 days a week from 10am weekdays, opening early on weekends from 9am. Choose your combination of fresh seafood from the cabinet, from fish to prawns, to bugs and seafood sticks, order with a side of Morgan's famous chips and take your box of goodness to the stunning outdoor deck area with a backdrop of yachts, trawlers and fishermen. Shaded by shelters, enjoy the yummiest and healthiest seafood take away in Brisbane. Cooked in the highest quality oils containing the Heart foundation tick of approval. Stunning views and the healthiest seafood take away available, what are you waiting for? Head to Morgans Seafood Take away and Fresh seafood market today! 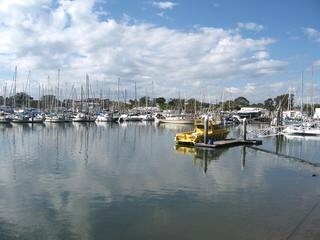 Located at the Scarborough Boat Harbour. I got rotten whiting from this market, will never go back.